On October 5, 2013 the San Diego Chinese Choral Society participated in the Art of Bel Canto 2013 concert, held by our director, Ms. Lucy Lin, and her students, performing two songs, 遺忘 (Yi Wang) and 尋覓 (Xun Mi). 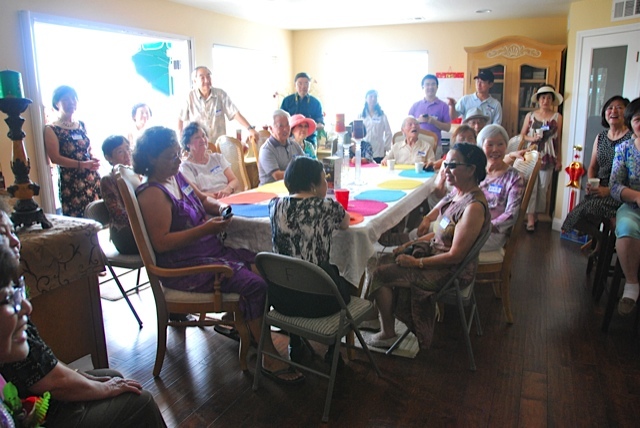 On August 24, 2013 the San Diego Chinese Choral Society celebrated the 25th anniversary of its founding in 1988 with a party at the home of founding member Ms. Winnie Fong (法薇). This celebration was attended by over 80 current and former members, featuring a review of the SDCCS's original performance, a prize drawing, and tributes to past leaders and keystones Ms. Ruth Lin (林路得), Ms. Mary Mao (何曼麗), Mr. Jia-Sheng Zhou (周家聲), host Winnie Fong (法薇) and current musical director Ms. Lucy Lin (林秋美). Thanks to all who attended, and to those who helped make this event possible. Pictures courtesy of Mr. Wu Song.